Baron Geisler might not be active in television now, but he says that his schedule is already packed because he has eight movie projects lined up. The actor is scheduled to begin shooting for an independently-produced film titled Lihis. He also mentioned that he hopes one project will make the cut in a renowned international film festival. “I’m really blessed because aside from this, maraming proyekto na naka-lineup. I’m doing one na taga-Hollywood ang mga kasama ko. "Kahit wala muna sa TV, pelikula muna. Baron expressed his gratitude for the people who have continued to trust in his acting ability despite the controversies that hounded him in the past. It will be recalled that Baron stayed with a rehabilitation facility for six months to deal with his alcoholism. BACK ON TRACK. In an interview with PEP.ph (Philippine Entertainment Portal) during the July 1 story conference of Lihis at Max’s restaurant, Scout Tobias, Quezon City, Baron expressed his gratitude for those who continue to support his showbiz career. Is Baron’s life on the right track now? “Sana po hindi na malihis,” he said with a smile. How does he feel about being the opportunity to act again? “I’m really blessed and thankful kasi I’ll just keep it up kung anong ginagawa kong tama. I don’t want to mess up anymore. ON LIHIS. For his comeback to the big screen, Baron will be starring in Lihis, which has a screenplay written by award-winning scriptwriter Ricky Lee. According to director Joel Lamangan, the characters in the movie are based on actual people that he knew during the 1970s. Direk Joel said that he got the idea for the movie in 2003, two years before Jake Gyllenhaal and Heath Ledger’s Brokeback Mountain was released by Hollywood. “Nauna pa kami sa Brokeback Mountain [a film about two gay cowboys released in 2005], pero walang producer,” recalled Direk Joel. He stressed: "Our movie is not a gay film. It’s a story that happens to have gay characters." In Lihis, Baron portrays Cesar, a poet who happens to be a member of the New People’s Army (NPA). He develops a romantic relationship with his comrade played by Jake Cuenca. Baron says of his character: “I play Cesar, who is a poet. He is very sensitive about things, about politics, about life. He happens to be gay and he falls in love with his fellow NPA kasama. What prompted him to accept this role? He turned serious as he pointed out: “Why not? I’ll be working with Jake Cuenca, Lovi Poe, Direk Joel Lamanagan, and writer Ricky Lee. Wow! How different is this from the gay character that he portrayed in the 2008 Cinemalaya entry Jay? “This is different. When I played a homosexual before, walang love. Sa Jay, I was a director na career-driven. This time, love-driven ito, e.
He also said that this movie marks a milestone in his career. Baron confirmed that he will he have kissing scenes and love scenes with Jake. How is preparing for that? Does he think it would be awkward for him to shoot intimate scenes with Jake? “Pagdating naman sa work, I will set aside my personal life. It’s just work. BARON THE FIREFIGHTER. 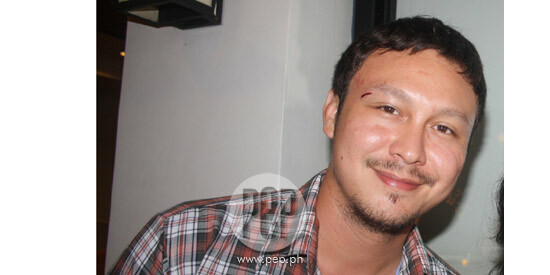 Baron then told PEP about his experiences as a member of Binondo’s volunteer fire brigade. “I am a real certified volunteer firefighter. I trained at sumabak ako sa tunay na fire,” he said with a smile. Baron said that he got to hold the hose and he entered a burning house. ON DEALING WITH TEMPTATIONS. Baron’s top priority for now is to do well in his job and save up again for his future. “I love the industry and they are loving me back. I’m trying to get things together,” he pledged. “One by one, nagagawa ko naman ang mga proyekto and, so far, wala namang nagiging problema. It’s all about love, I think. How does he deal with temptations now? When asked about the scar on his forehead, Baron revealed that he got injured while boxing.